I have to admit there are days when my plants own me and not the other way around. Yesterday was one of those days. Most years, I stop moving new plants to the garden in early May, but this season I’m running late and I was in a bit of a panic. Blame it on the gloriously damp, cool British spring we enjoyed this year. (Seems like a distant memory, doesn’t it?) All the rain led to weeks when it was too wet to plant, and now there were still 30 or so shrubs and perennials sitting in front of my garage clamoring to get out of their pots and into the ground. Late spring planting is a dilemma, though. Transplant too late, and the plants rarely have enough time to get established before our typical hot, dry summer weather commences—unless you have room in a prepared bed with amended soil and a regular watering routine. I had none of these for the unplanted 30. My holding bed was full to the brim. (More on the daylily collection that’s occupying space there in a future post!) My plan, hatched during our too-early bout with 90-degree temperatures a week ago, was to wait and move them into the garden in fall. But keeping plants in individual pots all summer long presents its own challenges. Especially with smaller pots—these were mostly in 4-inch and quart pots—daily watering is essential. Miss a day or skip a pot by mistake during hot, dry weather, and the unwatered plant may be a goner. At the very least, its roots and top growth are damaged. If plants in small containers do survive the summer, they are never better for the experience. 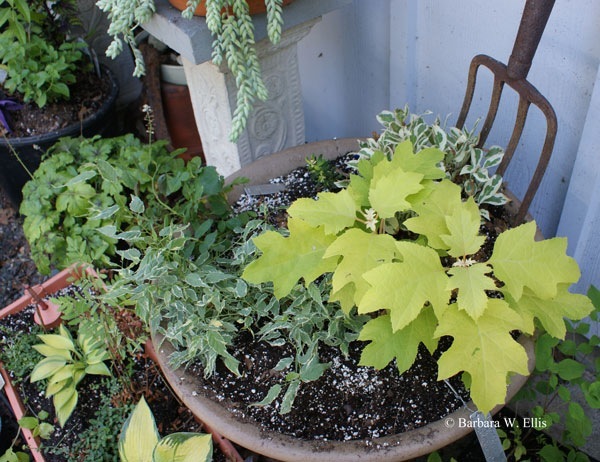 Above: Chartreuse-leaved oakleaf hydrangea (Hydrangea quercifolia ‘Little Honey), variegated Japanese kerria (Kerria japonica ‘Picta’) and several other plants settled in to temporary quarters for the summer. Fortunately, I had picked up a couple very large plastic pots at CostCo that look like they are made of something more dignified. Paired with a bale of ProMix, they made perfect emergency holding beds. I planted five plants per pot, which means they’re all stuffed in pretty tightly. Then I moved on and filled a self-watering window box and several large nursery pots with ProMix and planted them as well. 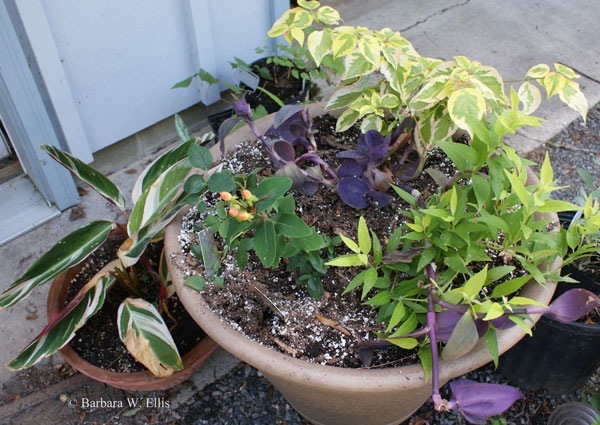 Above: Hypericum ‘Olivia’, Deutzia ‘Chardonnay Pearls’, ‘Golden Shadows’ dogwood (Cornus alternifolia ‘Golden Shadows’), and purple wandering Jew (Tradescantia pallida ‘Purpurea’) all share space. To the left is a newly potted clump of tender perennial Stromanthe sanguinea ‘Tricolor’. To be sure, plant stuffing as an underlying design technique makes for some less-than-ideal combinations. I’ve got too many stars and not enough background plants, for one thing. Plus, all of the plants will completely outgrow their space by fall and be in need of better quarters. But that’s life, at least in my garden. If I didn’t take charge of the unplanted masses, I would surely have killed a percentage of them by the fall. I’ll spend time this summer preparing new beds for them all, then come September, will dump out the temporary holding beds and transplant their contents properly. In the meantime, I hope the unplanted 30 appreciate their summer digs. I know they’ll be lots easier to keep happy. Along the same lines – never underestimate what can go into a container arrangement… When we move I want to take some of the perennials with us, so I have Coral Bells mixed with Hosta, pansies and vinca, Japanese Painted Fern combined with Calico Hot Peppers and annual Begonia. Its amazing what looks and thrives in containers! Hi Sarah! Great to hear from you here! Even though the combinations are silly if you think about how big the plants are going to be eventually, they look okay now, and I know they’ll be happier this summer! I love mixing unusual colors of flowers and foliage in containers. There’s always something new and interesting to see every day.